Brave is an adventure fantasy 3d animated movie that is distributed by Walt Disney. Premiered in 2012, it is set in the medieval period and centers on Princess Merida, a princess who is also a skilled archer. The story is basically about how the princess, wanting to be able to make her own choice, clashes with the Queen, who wants her to be more lady-like. The disagreement culminated in Merida’s mother turning into a bear, and they went on an adventure trying to turn her back and repair their broken bond. The movie was well-liked by a lot of people, receiving several awards and box office success. The main character of the movie, Princess Merida, was not the typical princess. She is a headstrong and a free-spirited lady who wants nothing more than to live like a normal person. 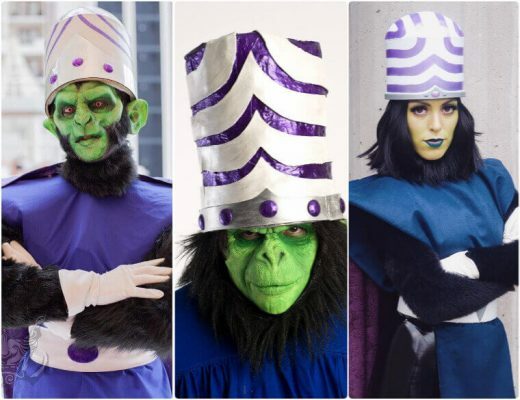 Her strong character has turned her into a favorite by a lot of teens and women to cosplay in. Since Merida is not your traditional princess, her outfits reflect more her adventurous and free-spirited nature. Her usual outfit includes a long dress with cloak and a bow and arrow. Princess Merida is not your typical princess, as she is not refined, elegant, or poise. She is unruly, loud, and impulsive, more of like a warrior or barbarian than a princess. She is also adventurous and a skilled archer and swordsman. Her personality is probably one of the reasons people like dressing up as her as she represents the anti-princess. 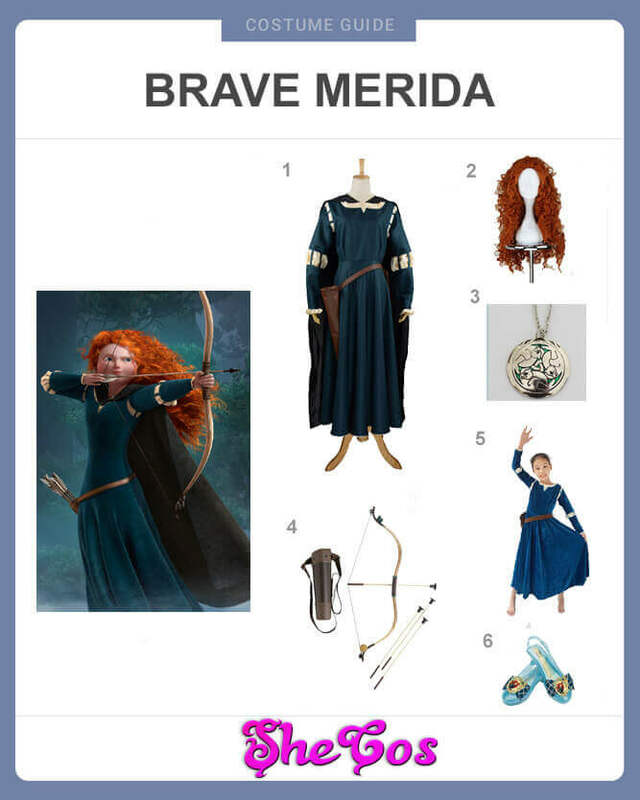 The cosplay set of Princess Merida will include her full costume and accessories. 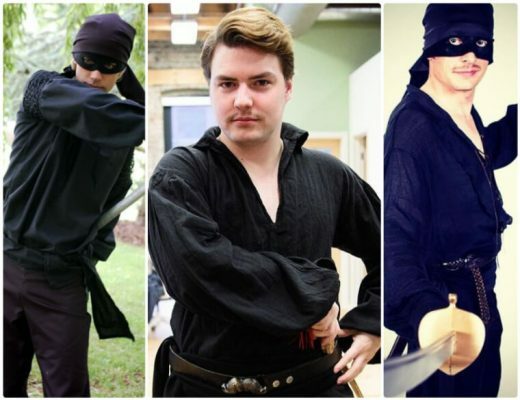 For the costume, it will include her long dark blue-green dress that has silver designs on the shoulder and elbows and a dark cloak. For the accessories, the set includes a long red curly wig for Merida’s hair, an archery set, and the silver pendant she used to pay the witch. 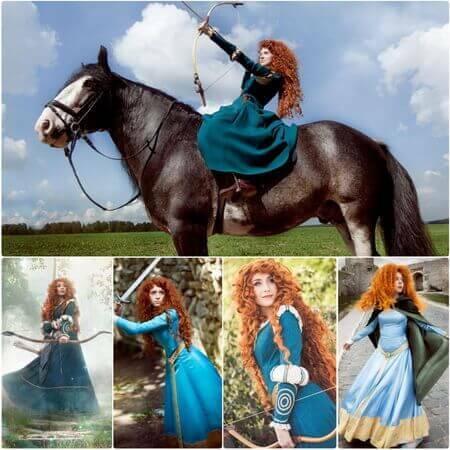 The cosplay set also comes with a full costume of Princess Merida for kids, complete with shoes, if you would like to cosplay with your child for Halloween party. Princess Merida is a popular choice to dress up as for a lot of women because she doesn’t reflect your typical princess. She is strong, brave, a skilled archer and swordsman, and unrefined. You might say that she is the anti-princess to the traditional princess and that is reflective throughout the movie. Despite being more of a warrior than a princess, Merida still possesses the qualities of a Disney princess, namely she still looks good. This makes her a great choice for photo shoots, costume parties, and comic conventions. 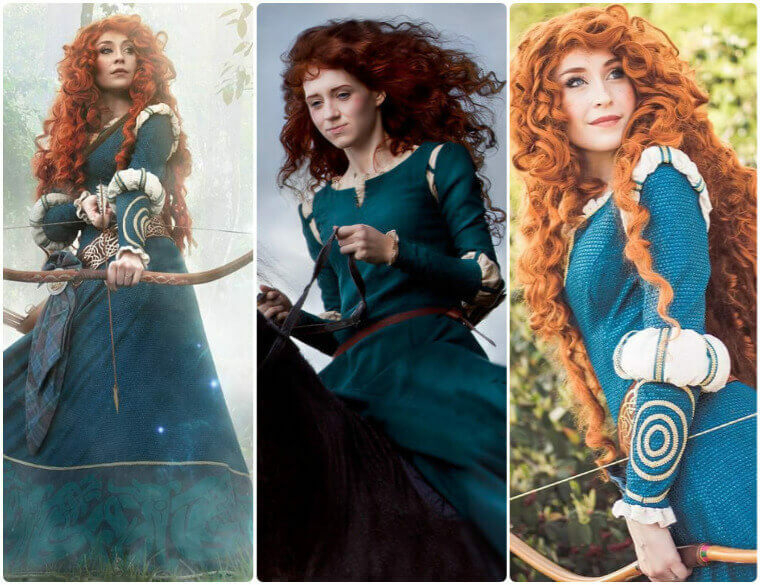 If you take a look at the cosplay photos, you can see that the unique combination of Princess Merida’s personality and characteristics. On the photos, you can see her warrior and adventurer side, with the use of her bow and arrow, and the sword. But it is also able to reflect her beauty and princess side, through the outfits that she is wearing, which is not really reflective of an adventurer and warrior.